For his Hammer Project CALIFORNIA FLORA (NATIONAL FOREST CONDENSATION WALL), Sam Falls traveled to each of the nineteen National Forests in California to gather material for his entry-stairway installation. HAMMER PROJECTS—SAM FALLS, through April 29. See: Sam Falls, Kastro, Antiparos (Los Angeles: DoPe Press, 2016). 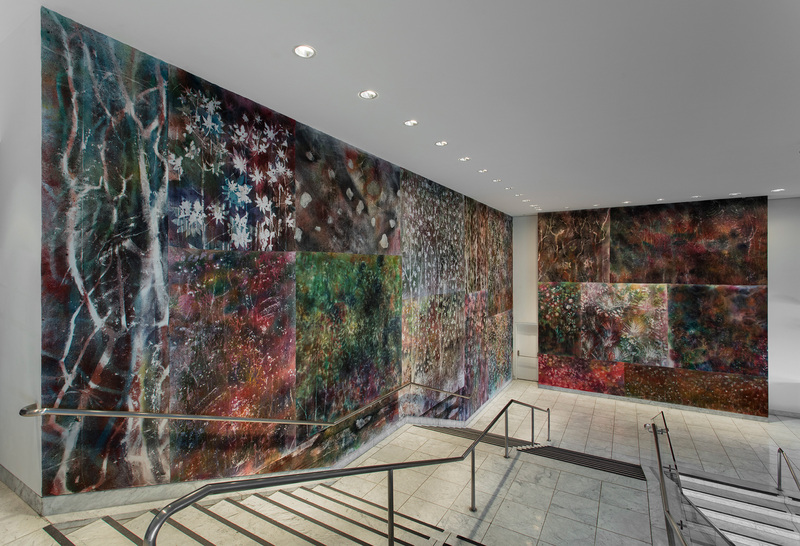 Hammer Projects—Sam Falls, installation view. 2017. Image credit: Hammer Museum. This entry was posted in ART, BOOKS/PERIODICALS and tagged dope press, Hammer Projects, Hammer Projects—Sam Falls, Kastro Antiparos (Falls), Sam Falls on February 10th, 2018 by Barlo Perry.